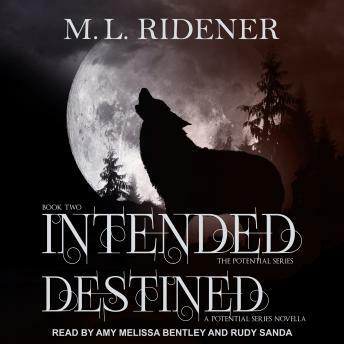 In this must-listen collection, M. L. Ridener continues her Potential series with the novel Intended and novella Destined. Intended: Chloe Weever always dreamed of finding her fairytale ending. Being a Potential and finding her soulmate should guarantee true happiness. But with Cyrus still stalking her with motives yet to be determined, she will do anything to protect the ones she loves-even if it means sacrificing her happily ever after. Falcon Tonalee made a promise long ago. A promise to always protect the one that fate chooses for him. But his vow is tested when his mate-consumed by fear-closes herself off and pushes him away. With danger lurking at every turn, will she realize that the only way to overcome the darkness is to fight it together? Destined: Will Mazie continue to keep Conner at arm's length? Will he let her? The days until her eighteenth birthday are winding down, and she won't know the truth until it gets here. Will she be destined for great love or just an obliterated heart?